Walnuts are available year-round and harvested beginning in August. Walnuts are sold in the shell and shelled. 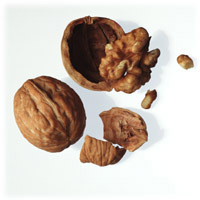 Once shelled, walnuts can be chopped to the desired size and used raw or cooked. Shelled and chopped walnuts can become rancid quickly and should be used within a week, refrigerated for up to six months, or frozen for up to one year. For long-term storage, it’s best to buy unshelled nuts. Walnuts are a well-known addition to many desserts, but they also enhance savory dishes like grains, stuffing, salads, and stir-fries.